Be the first to share your favorite memory, photo or story of MRS. SHELIA . This memorial page is dedicated for family, friends and future generations to celebrate the life of their loved one. 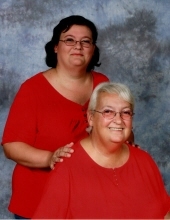 Mrs. Shelia McGarr Baker, a resident of Tallassee, Alabama, passed away Saturday, April 13, 2019, at the age of 72. Funeral services will be held Monday, April 15, 2019, at 2:00PM at East Tallassee Church of Christ with Rev. Mike McElroy officiating. Burial will follow at Carrville Cemetery, Jeffcoat Funeral Home directing. Mrs. Baker is survived by her daughter, Kay Strong (Jason); son, Larry Baker; grandson, Cody Baker and numerous nieces and nephews. She is preceded in death by her husband, Donald Lorell Baker, parents, Hilyard Bertha and Maudie McGarr; brother, Johnny McGarr; sister, Jimmie Ruth Willis and her grandson, David Lee Baker. To send flowers or a remembrance gift to the family of MRS. SHELIA McGARR BAKER, please visit our Tribute Store. "Email Address" would like to share the life celebration of MRS. SHELIA McGARR BAKER. Click on the "link" to go to share a favorite memory or leave a condolence message for the family.